U.S. Navy photo by Andrew Revelos — From left to right, Capt. Pete Nette, commanding officer of Naval Support Activity South Potomac, Ruby Brabo, member of the King George County Board of Supervisors for Dahlgren, Ed Jones, president of the Dahlgren Heritage Foundation, Robert Gates, vice president of the Dahlgren Heritage Foundation, John LoBuglio, vice chairman of the King George County Board of Supervisors, and Dale Sisson, chairman-at-large of the King George County Board of Supervisors, cut the ribbon opening the Dahlgren Heritage Museum on Oct. 19. 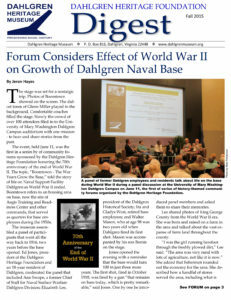 Community and military leaders joined members of the Dahlgren Heritage Board on Oct. 16 to cut the ribbon and open the long-awaited Dahlgren Heritage Museum. The ribbon-cutting marked the end of a three-year effort organized by the board-supported by King George County and the base-to establish a museum to tell the story of Dahlgren. The museum is located on the site formerly occupied by the Virginia Welcome Center and features exhibits detailing the accomplishments of Dahlgren’s scientists, engineers and Sailors in the installation’s more than nine decades of service. Banners presented those achievements by decade alongside historic items, such as the shells of naval guns. Capt. Pete Nette, commanding officer of Naval Support Activity South Potomac, said he enjoyed working with community leaders and was pleased to see the project come to fruition. Ruby Brabo, member of the King George County Board of Supervisors for Dahlgren, seconded Sisson’s praise. “I’ve been so impressed with all the work everybody has done to put this together, to make this vision a reality,” she said. An avowed history buff, Brabo hoped the museum would help bring more tourism to the area. “Tourism is a $21 billion industry here in Virginia, so I look forward to King George County finally capitalizing on [this],” she said. Ed Jones, president of the privately-funded Dahlgren Heritage Foundation, thanked a long list of people for their contributions to the project. Jones called the museum “a dream come true” when the site was unveiled to Dahlgren School alumni before the ribbon-cutting. Jones offered special recognition for a Dahlgren School alumnus whose family treasures are no on display at the museum. “One of our alums deserves special thanks and that is my friend Carlton Middlebrook, from Dahlgren School, who has loaned us two very important artifacts,” he said. Those two historic items on display at the museum-a Norden bombsight and N-9 seaplane propeller-were graciously loaned by Middlebrook, son of legendary Dahlgren avionics mechanic Charles Middlebrook. The elder Middlebrook was trained by Carl Norden and inspected the bombsights bearing his name as they were delivered to the Navy, from the 1930s through World War 2. The seaplane propeller was part of a lesser known aspect of Dahlgren history. On Sept. 15, 1924, the Naval Research Laboratory conducted the first radio-controlled, pilotless flight from the installation, the first in the United States. The N9 seaplane was fitted with gyro-actuated automatic controls adjusted by Charles Middlebrook. Though that first pilotless flight lasted less than 15 minutes, the experiment marked the first milestone on a technological path that eventually led to today’s unmanned aerial vehicles.